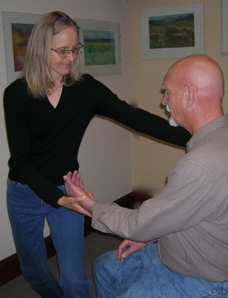 Private Feldenkrais® lessons, called Functional Integration, address your individual needs or interests. The student may stand, walk, sit down or lie on a table as Margot uses gentle, non-invasive touch and movement to retrain the nervous system, creating new physical and mental habits. The student learns to integrate new patterns, improving muscular-skeletal organization and posture. By learning to move more naturally with less effort, pain is reduced or eliminated, the breath is mobilized and balance and performance are enhanced. Students increase coordination, range of motion, mental function, and lengthen the spine. Margot recommends a series of weekly lessons for optimal benefit.